Chances are you have heard or seen the Sugarloaf Mountain (Pão de Açúcar), Copacabana beach or even the statue of Christ the Redeemer. All are relatively famous sights no tourist can avoid or miss in Rio, Brazil. Yet, tucked away at the end of an uninviting narrow cobbled street is a very colourful sight sure to brighten your day. At the limits of the Santa Teresa and Lapa neighbourhoods, these stairs attract artists and tourists alike. 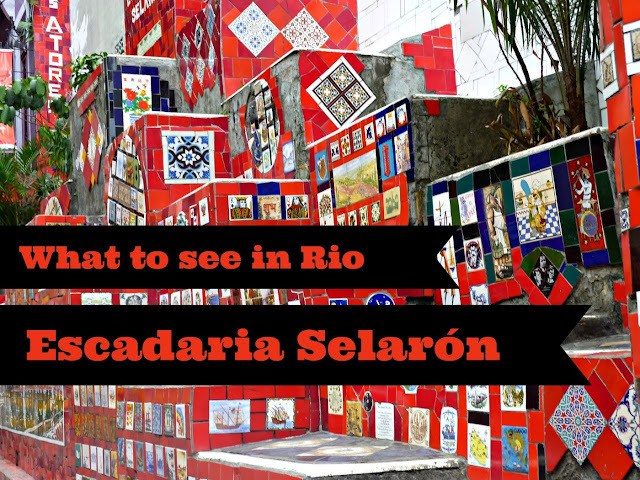 Selarón's steps are surprising, crazy, brilliant and definitely worth a detour in Rio. Selarón, its creator, was a Chilean artist who decided to renovate this stairway in the 1990s as a side project. 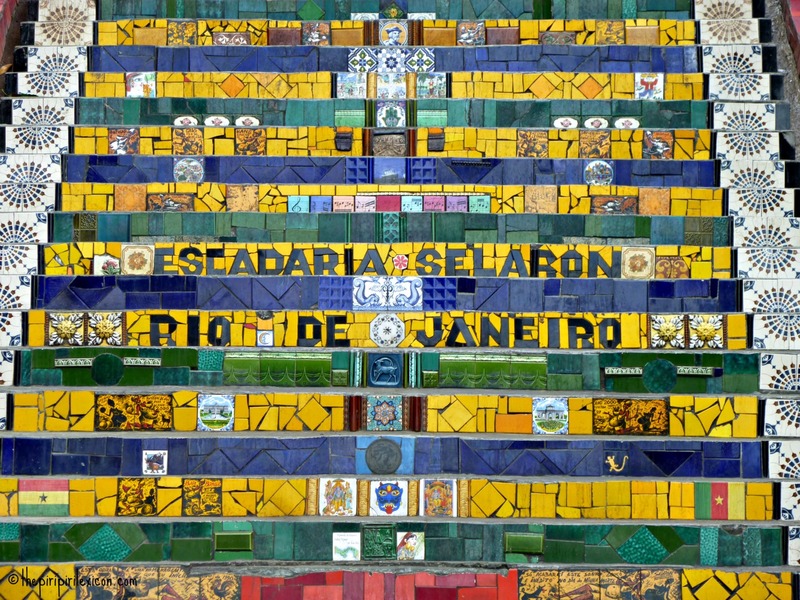 He started by laying tiles the colours of Brazil: yellow, green and blue. This evolved into a real lifetime project and obsession. He claimed this would never be finished. The first tiles were salvaged from building sites around Rio but later tourists and visitors started bringing him tiles from around the world. This is what makes it interesting, in my opinion. As you walk up the 200+ steps, you discover places, shapes, colours and designs from around the world. The stairs have a little something of Gaudi and Barcelona's colourful tiles. During our visit, last summer, Selaron was there (as he apparently did most days). He happily chatted with everyone having a look at his work. He was there to receive the tiles too, of course. He asked us where we were from and on hearing our (rather complicated family story) he lead us to the different tiles related to our family. This made it all the more interesting and fun. How often do you get to talk to the creator of a monument? Our, then, 2 and a half year old loved it too. She loved walking up and down the stairs while looking at what animal or interesting item she could find on the tiles. This spectacular piece of living art is really worth a visit. It is free and not to be missed. Unfortunately, though, Selarón died in January this year. His body was found on the steps. 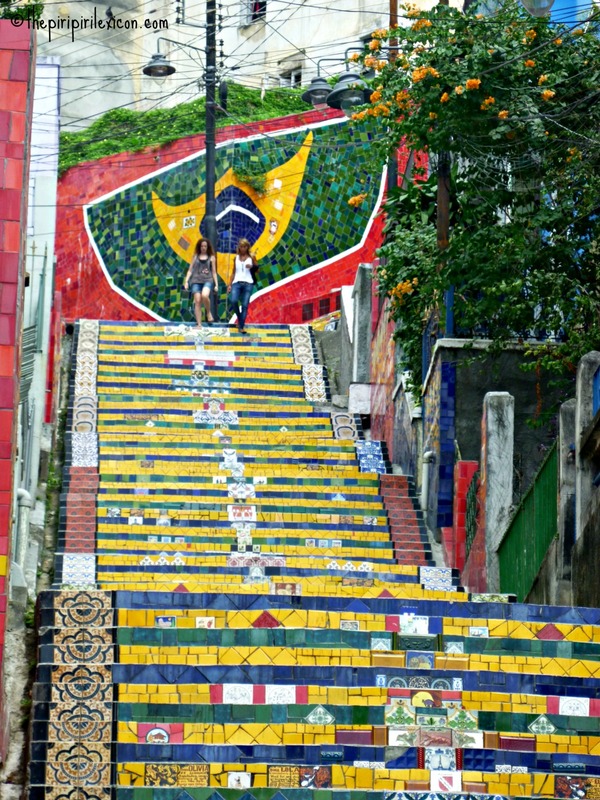 The city of Rio made the staircase into one of its officially designated landmark. But the feel of the place is very different now. P just went back to it, a couple of weeks ago, and says there is an armed guard at the foot of the steps as well as people trying to take sell you memories from the site. 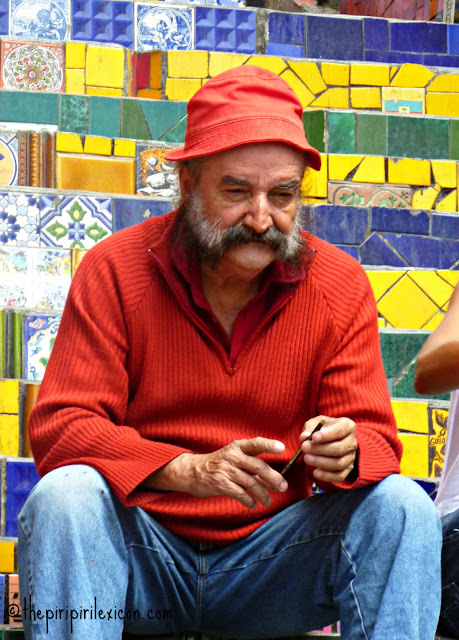 Selarón was clearly the guardian of his living art, but with him gone, it is merely becoming another tourist attraction. 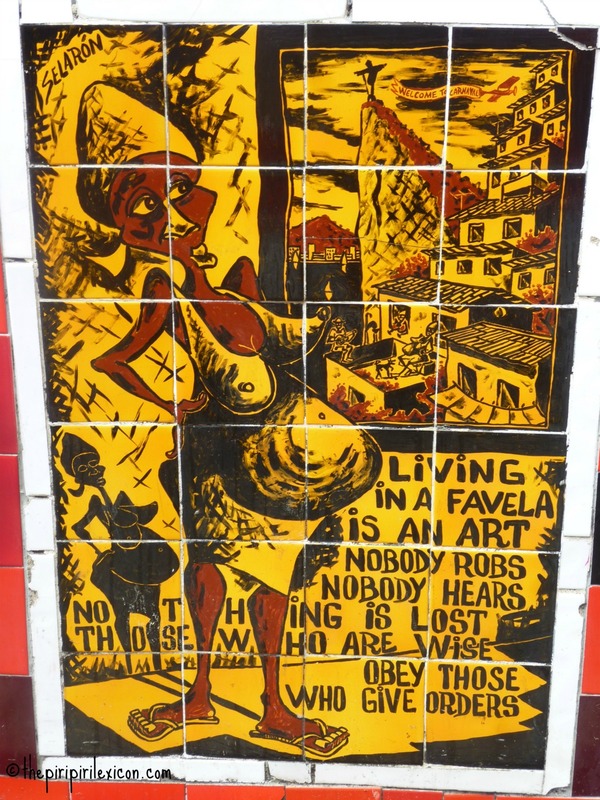 Go for the story of the place and for the artist's memory. While you are there, if hunger strikes, the Adega Flor de Coimbra right in front of the steps is a great address for a typical Portuguese bacalahau (cod dishes).